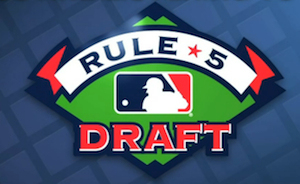 The Rule 5 Draft has come and gone and the Blue Jays were fairly active overall. As I predicted, the Blue Jays took a pitcher, lefty Brian Moran and promptly flipped him to the LA Angels for $244,000 in extra cap space to be used for the signing of international free agents this summer. Ok, I didn’t predict that the Blue Jays would trade for cap space but I figured that if they took a pitcher then he’d be traded. The first and only Blue Jay to be lost in the draft was neither Ryan Tepera or Marcus Walden, but their teammate on the New Hampshire Fisher Cats, lefty reliever Evan Crawford, who was selected third in the Triple-A portion of the draft. The 27 year old who had a cup of coffee in the big leagues in 2012 spent this year coming back from injury in Dunedin and New Hampshire and pitched to an ERA of 5.60 over 45 innings (38 in Double-A) with a 1.71 WHIP, 23 walks and 44 strikeouts. Crawford definitely has shown that he still has what it takes to strike guys out and if he can get a handle on his control he could get back to the bigs on the south side of Chicago. The Blue Jays, following the loss of Crawford, restocked their minors somewhat by taking three pitchers in the Triple-A portion of the draft. The first was righty Roberto Espinosa from the Pirates’ system. The 21 year old Mexican had a solid year pitching mostly in relief for the Pirates Short-Season A club in Jamestown. He had a 2.55 ERA in 24 2/3 innings with 15 walks and 22 strikeouts. He had five hit batters and five wild pitches showing that he’s going to need to reign in the control. The Jays also selected lefty Richard Bleier from the Texas Rangers. Bleier, 26, has a bit more of a track record and had a very good year last year split between Double-A and Triple-A. He threw a combined 81 1/3 innings (making four starts along the way) and had a 3.32 ERA, 1.28 WHIP, 20 walks and 49 strikeouts. Not surprisingly, Bleier posts much better splits against left-handed batters, holding them to .417 OPS last season. He looks like LOOGY-only material: righties torched him for a .318/.361/.468 line in 2013. Apparently, Bleier is a fan of Mark Buehrle and is Jewish so he’ll join Scott Silverstein, Ian Kadish and Kevin Pillar as Blue Jays from the tribe (no, not the Cleveland Indians). Just six short of a minyan now. Finally, the Blue Jays selected 25 year old righty Scott Shuman from the San Francisco Giants. As recently as 2011, Shuman was tagged by John Sickels as a sleeper prospect (for the Tampa Bay Rays), throwing 92-95 mph with a good slider. Unfortunately, Shuman hasn’t been able to conquer Double-A, posting two consecutive seasons there (for the Rays in 2012 and for the Giants in 2013) and having ERAs over 8.00 and WHIPs over 2.00 in both years. Shuman walked more batters (42) than he struck out (39) and I’m assuming that the Blue Jays are looking to see if they can turn him around. So that’s your Rule 5 haul folks. Now I’m going to climb back into bed and try to recover from this horrible cold.